Anti-Semitism thrives and is unleashed, among other things, when hate is fostered and allowed to go unchecked. Following the attack on the Pittsburgh synagogue this week, many blame the current president for that. However no less significant is when a former president shares the stage with and gives credibility to Louis Farrakhan, one of the most rabid anti-Semites in the US, as if that’s normal and OK. Hate and anti-Semitism are fostered when another former president refers to victims of a different anti-Semitic attack in Paris as “random…folks” as if they were not targeted because they were Jewish. Anti-Semitism flourishes when the head of a major British political party honors terrorists who have murdered Jews, and fights over nuances in adopting a universal definition of anti-Semitism. That the Queen much less the majority of the party doesn’t speak out and condemn his positions, or throw him out altogether, gives his views and those of other haters further credence. But let’s be clear, anti-Semitism is not new and is not the “fault” of any one political leader. Yet, surely the fostering of hate allows those with a particularly twisted anti-Semitic agenda to let their views become public. In that case, all are responsible for not uprooting it altogether much less fostering it, in any way. As much as anti-Semitism is not new, it is unique. Attempts to universalize it are naïve and specious at best. And yet I see that far too often. Please, do not compare it to, or explain it by, other forms of hate. It goes back thousands of years since the Jewish people became the fist monotheists, to believe in, worship and revere one God, the One True God. 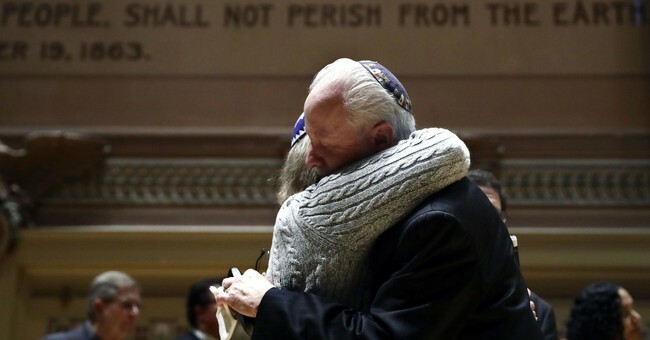 Unique in our liturgy, Jews pray for God to strike down our enemies. What other religion does that, much less has to do that, or can even think that way. Conversely, some “revere” their god by in fact preaching violence against others. Fortunately, because of my many Christian friends, and meaningful interaction with them, I get to witness, experience, and be strengthened by love and support expressed to me, but really meant for the Jewish people as a whole. I do everything I can to be sure that Jewish friends and others understand that Christian support for Israel is sincere, and different from not too distant past when “the church” fomented anti-Semitism. In recent years, it’s become a slippery slope between someone being anti-Israel, and anti-Semitic. Too often, and more so in recent years, lines are blurred and anti-Israel positions are used as a thin whitewash for anti-Semitism, and in many cases, it is a catalyst for anti-Semites to blur the line. As much as Pittsburgh was a wakeup call, too many people have hit the snooze button for too long. I am guilty of that if only because of the internalization of the fact that there will always be anti-Semitism, accepting that in a “boys will be boys” fashion, and living with it. Recently I have been exposed to anti-Semitism, not for the first time but in a new way: on line. Through Run for Zion, bringing Christians to participate in a race throughout Jerusalem, and offering a free trip to Israel contest as a promotion and to create awareness. Initially, I was surprised that such a contest would attract anti-Semitic trolls on line who felt the need, and right, to post their hateful messages. Then I became shocked by the hubris and regularity of such posts. It’s safe to say one would not experience that offering a free trip to anywhere else. Some posts are overt anti-Semitism (using phrases and libels that would make Hitler and Farrakhan blush) such as calling Jews “the synagogue of Satan.” Some are vulgar and, in another era, could even warrant police investigation when profanity mattered. Some are more veiled by advocating boycotting Israel through a vile BDS “movement” that’s used anti-Israel rhetoric to feed and foster overt anti-Semitism. And some focus on the delegitimization of Israel with the fake history (and theology) of Israel being Palestine and Palestinian Arabs being the indigenous people in the Land that God gave to Abraham and his descendants. Fortunately, many Christian friends repel this underlying hate that’s often rooted in a replacement theology strain of Christianity. Some are shocked because they never heard of replacement theology or BDS, and horrified that people actually could think this way. Many Christian friends are shocked by the prevalence of anti-Semitism because they cannot imagine thinking the way much less acting on it. So, what’s a good person to do? Understand anti-Semitism. Call it out in every forum possible. Adding temporary Facebook profile pictures may feel good but doesn’t change much. When reporting people’s anti-Semitic posts, the best FB offers is for me to report it as “inappropriate” and block the user. If social media platforms won’t prevent posting something that’s overt hatred much less anti-Semitic, at least they should govern it themselves and close the accounts of those who make these posts. Prosecution is important but more than that, hold elected leaders, law enforcement and social media accountable to prevent it. And yes, embrace us. Stand with us. Try to understand us and why we might resist your overtures. And, as Christians, embrace what we have in common starting with the Creator of the Universe, the God of Abraham, Isaac and Jacob. I was invited to speak about anti-Semitism at a Christian prayer event in Orlando on November 15. While I am no expert I know enough, but didn’t know what to stay. Now, I can’t think of what not to say. If you’ll be in or near Orlando then, please join to pray and show your support.